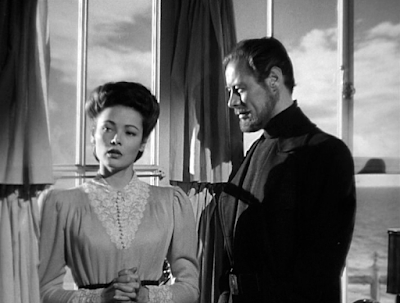 The Chicago Film Club’s Halloween series begins with a screening of the classic The Ghost and Mrs. Muir (1947) Saturday October 8, 2016 at the Daystar Center, 1550 S. State St. All movies start at 6:45 p.m. When a young widow Lucy Muir (Gene Tierney) rents a house by the sea, she finds that it’s haunted by the ghost of Captain Gregg (Rex Harrison), the home's original owner. The two clash at first, but come to an understanding that turns into friendship and eventually love. When a flesh-and-blood suitor (George Sanders) makes a play for Lucy, what will become of the captain? This beautifully filmed movie (Charles Lang’s black and white cinematography was Oscar nominated) gave Tierney the chance to play a woman of warmth and character, rather than the icy, aloof beauty she was too often cast as. Besides the cast, the film has quite the pedigree. The film score was composed by the legendary Bernard Herrmann (Vertigo, Psycho, Taxi Driver). Charles Lang (Sabrina, Some Like it Hot) was in charge of the black and white cinematography. Lang was nominated for 18 Academy Awards. Film editor Dorothy Spencer (Stagecoach, Foreign Correspondent) worked with some of the best directors in Hollywood, including Alfred Hitchcock, John Ford, and Elia Kazan edited the film. Fred Sersen who was in charge of the photographic effects department at Twentieth Century-Fox created the film’s special effects. Sersen won two Academy Awards for Best Effects (Crash Dive, The Rains Came). Gene Tierney’s husband, Oleg Cassini, designed the actress’s costumes. Cassini dressed Jacqueline Kennedy when she was First Lady. And last, but not least, the director Joseph L. Mankiewicz. Makiewicz is most famous for writing and directing All About Eve (1950), but he also directed A Letter to Three Wives (1949), The Barefoot Contessa (1954), Guys and Dolls (1955), Cleopatra (1963), and Sleuth (1972).